Buffalo mozzarella is a mozzarella made from the milk of the domestic water buffalo. The history of water buffalo in Italy is not settled. One theory is that Asian water buffalo were brought to Italy by Goths during the migrations of the early medieval period. However, according to the Consorzio per la Tutela del Formaggio Mozzarella di Bufala Campana, the "most likely hypothesis" is that they were introduced by Normans from Sicily in 1000, and that Arabs had introduced them into Sicily. The Consorzio per la Tutela also refers to fossil evidence (the prehistoric European Water Buffalo, Bubalus murrensis) suggesting that water buffalo may have originated in Italy. A fourth theory is that water buffalo were brought from Mesopotamia into the Near East by Arabs and then introduced into Europe by pilgrims and returning crusaders. "In ancient times, the buffalo was a familiar sight in the countryside, since it was widely used as a draught animal in plowing compact and watery terrains, both because of its strength and the size of its hooves, which do not sink too deeply into moist soils." Production in and around Naples was briefly interrupted during World War II, when retreating Nazis slaughtered the area's water buffalo herds, yet commenced a few years after the armistice was signed. Spray skillet with nonstick cooking spray, place smoked sausage in skillet, cook for 5 minutes. Remove from heat and set aside. Preheat oven to 350 degrees. Spray baking dish with nonstick cooking spray. In a bowl, combine pasta, sausage, 3/4 cup Mozzarella cheese, Parmesan cheese, dash salt, pepper, basil, oregano, garlic powder and cream of mushroom soup. Pour into baking dish. Bake for 15 minutes. 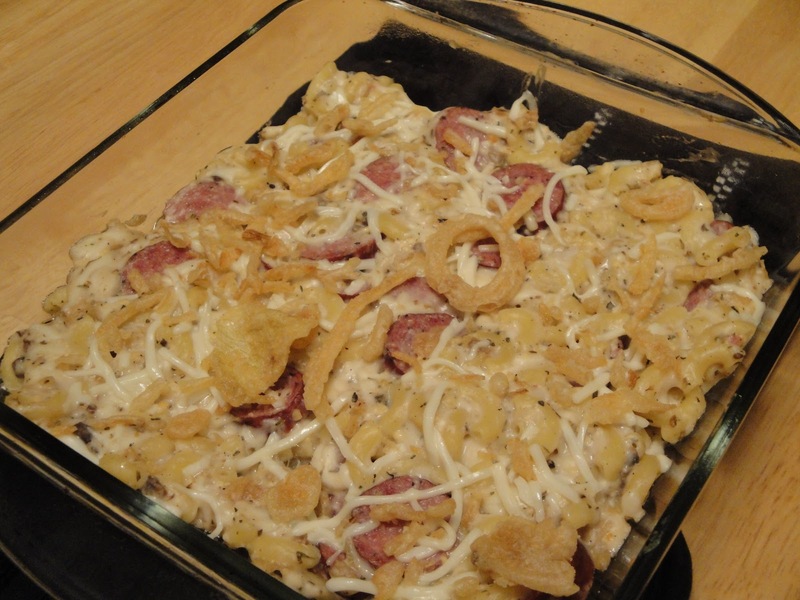 Remove from oven, sprinkle remaining Mozzarella cheese and french fried onions. Bake another 5 minutes. Enjoy! This dish is very appealing my kids would love it too! thanks for sharing! Hubs would go nuts for this one. Christine this is my kind of casserole! I love smoked sausage and everything tastes better with those fried onions. Looks yummy, Christine... I adore smoked sausage! Pasta with smoked sausage is pretty good combination I guess :) Simple but yet so filling and lovely dish. I have never tried buffalo mozzarella... now I must give a try. Great dish!! I have been totally obsessed with buffalo mozzarella lately--I just eat it plain, that's how good it is. What a great-looking casserole! Wonderful things are made with Cream of Mushroom soup. I discovered that was one of my mother's cooking secrets. I've never tried buffalo mozzarella cheese, but I'm intrigued. Cream of Mushroom soup adds a lot of flavor to a dish. Christine, I love this especially the buffalo mozzarella! Delicious pasta dish, Christine and great background on buffalo mozarella too! I love mozzeralla di bufala and paired with smoked sausage.... Yum! Interesting background, too.